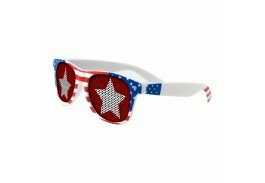 Show your American Pride by adding patriotic custom sunglasses to your next outdoor event! 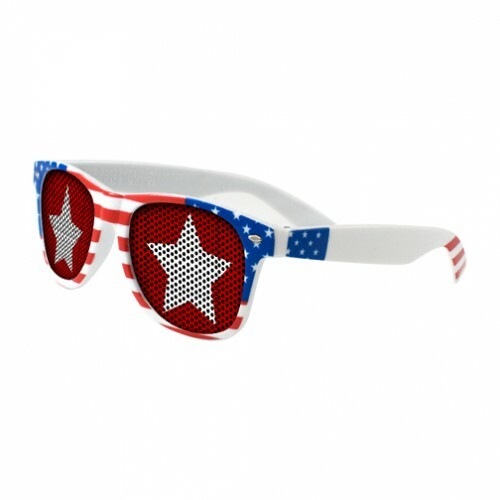 Perfect for 4th of July parties or other holidays and events, the sturdy frames feature a USA Flag print that makes a perfect billboard for your company. Both lenses feature your artwork in a beautiful full color process that will make a bold impression on anyone who sees it. Customized sunglasses are a great giveaway for beach-themed events, charity or school fundraisers, luau parties and more!A full color imprint on Both Lenses is included in the setup. Production Time: 3 Business Days after approval. For Rush Production, please call for details and availability.